Our first morning in Marin County, Carol and I were hungry for breakfast, so I took a quick look at the internet (with Yelp being based in SF, there’s no shortage of reviews for places in the Bay Area), and found one place that had a very strong following just down the way from our hotel: Fred’s Coffee Shop in Sausalito. Heading down to Sausalito, Fred’s was pretty easy to find, it’s right on the road into town, well before you hit heavy traffic. So we grabbed an easy parking space and headed in. Three things were immediately apparent upon entering Fred’s: (1) This is definitely a popular place for both tourists and locals, (2) service was a bit slow. Everyone had that “we’ve been waiting too long” look on their faces, and (3) The grill guy was obviously good, and had quite an impressive array of good looking dishes going on the grill. We ended up finding two seats at the end of the counter (saving us a good 30 minutes’ wait), and we ordered breakfast. 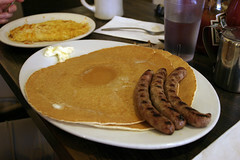 The menu at Fred’s is your basic coffee shop fare (eggs, ham, hash and and stunningly long list of sausages, as well as pancakes and deep fried french toast). While being somewhat tempted by the “Swedish Breakfast”, an open-face sandwich of hamburger, eggs, cheese and grilled onions, we decided to go traditional–Carol ordered pancakes with the pecan sausage, and I ordered pancakes with Chorizo and hashbrowns. 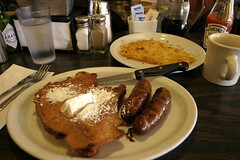 That’s where we encountered a hiccup: While Carol got her order, I was given French toast instead of pancakes. However, I decided not to complain, the French toast was phenomenally good (but horribly unhealthy), with a creamy texture, a nice eggy breading, and nice crisp exterior. It was nicely complemented by the perfectly fried and not overly greasy chorizo. The hashbrowns were also well done, nicely crisped yet tender. Carol’s pancakes weren’t nearly as good as the French toast, but were still enjoyable. The pecan sausage was as good as my chorizo, however. Adding it all up, it was a thoroughly good breakfast, and I enjoyed my French toast enough to make up for the fact that they weren’t what I ordered. 1. The food here is definitely good. We enjoyed our food, particularly the French toast and the sausages, and it’s clear that they can really churn out some good food from their grill. 2. This is one of those coffee shops that has the ambiance I look for in a coffee shop. Friendly service, relaxed atmosphere, good food, good coffee, and a nice cross-section of locals. 1. The service was definitely off. The food I got (while excellent) wasn’t the food I ordered. The service was slow, my coffee cup only refilled upon repeated requests, and there was quite a bit of disorder in the grill area. And, honestly, from what I could see, this was a classic case of “half-assed over-management”. The cook at the grill clearly knew what he was doing, and he was well organized and efficient, except when the manager stuck her nose into things. Similarly, the waiter and the bus-boy seemed reasonably organized overall, but would be halfway through a task when the manager made them drop what they were doing and start something else, and then chide them for not finishing the first task. It was painful to watch what should’ve (and easily could have been) a smoothly operating restaurant get derailed like this. General opinion: Despite it’s few minor flaws, I really enjoyed Fred’s, and the quality of the food more than made up for the shortcomings. 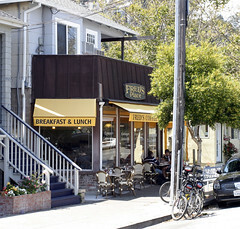 I’m definitely planning on trying Fred’s again if I’m in Marin County any time soon. Thanks for a really clearly written review of your experience.